Greenwoods Hotel and Spa01277 829990work HotelWith a breath-taking blend of 17th century architecture and a stunning English garden setting, Greenwoods Hotel & Spa offers for the perfect backdrop for any event and occasion. Our reputation for style, outstanding service, as well as quality entertainment and food, will ensure you and your guests have an amazing experience every time! Conveniently located near Billericay and Chelmsford and just a short journey from London the stunning Grade 11 listed hotel is host of some fine original features, each with a story to tell about the building's impressive history. Ellis's is an AA rosette awarded restaurant serving exquisite food to residents and non-resident 7 days a week. Greenwooods Hotel had 39 beautifully-appointed bedrooms including six premier rooms. Choose to stay overnight and enjoy the use of our 20 metre lap pool , jacuzzi, steam room, sauna and recently refurbished gym. A wide range of treatments are also available to book during your stay and check out website for details of spa packages and regular special offers. 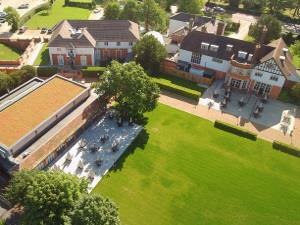 An ideal location for business meetings, conferences and team building events, Greenwoods also offers a full programme of events throughout the year, including themed afternoon teas, Murder Mystery nights, Christmas party nights and a New Year's eve gala ball. The inside function rooms lend themselves perfectly to private events, including birthday parties, baby and bridal parties and the Garden suite accommodates up to 250 for a sit down meal suitable for parties, anniversaries and weddings. With a breath-taking blend of 17th century architecture and a stunning English garden setting, Greenwoods Hotel & Spa offers for the perfect backdrop for any event and occasion. A12 to Colchester. B1007 to Galleywood/Billericay. At roundabout go right. Straight over next roundabout. Rd leads to Stock. After approx 5 mins pass Crondon Park Golf Course. 2nd turn on right-Greenwoods Hotel. Right out of station, left at mini-roundabout. Straight over next mini-roundabout & all traffic lights until roundabout. 2nd exit onto Stock Rd B1007. Enter Stock, continue through village, as leaving you will see Greenwoods Hotel Car Park.